I love my 2010 Macbook, but lately she’s become less of a workhorse and more of a gentle farm pony you feed carrots to at the barn. She tires easily and she doesn’t like to be far away from an outlet. While years of proper care and letting the battery cycle have kept the laptop in good shape, it’s never that surprising when laptop batteries degrade over time. 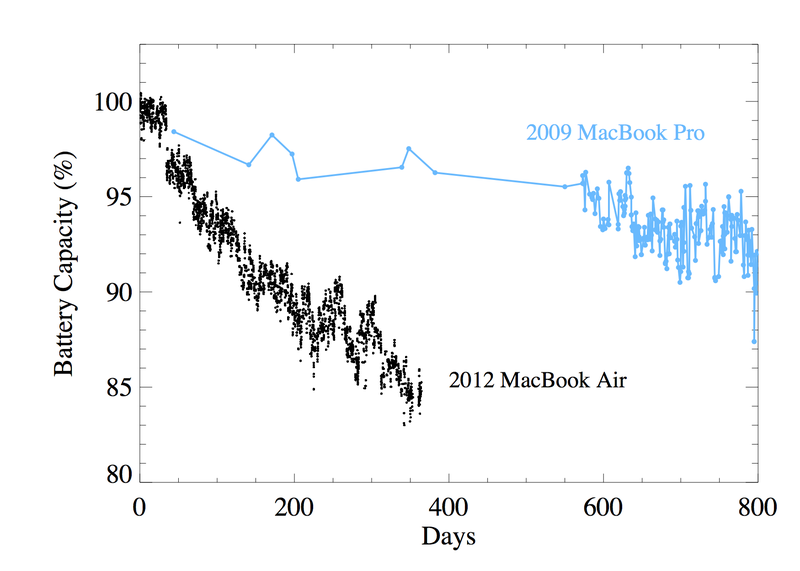 University of Washington PhD candidate and avid dataviz blogger James Davenport conducted a year-long observation of his new Macbook Air, which focused on monitoring battery efficiency and capacity as it shifted over the first 365 days of use. Of course, the MacBook Air has always been heavily praised in the battery life department, and the 2012 Macbook Air at times exceeded its promise of up to 7 hours of battery life. While those initial tests seemed promising, Davenport’s careful monitoring of his Air showed that over time, the results changed. Within a year of use, Davenport’s Air dropped down more than 15 percent in capacity, leaving its overall charge power under 85 percent of its initial capacity. After staying at maximum capacity for the first month, the rate decreased steadily over time, with an average cycle dipping a few percentage points roughly every four weeks. Even more stark was the reduction in capacity compared to Davenport’s previous computer, a 2009 Macbook Pro. While the Air boasts better overall battery performance, Davenport’s records show that his old Pro had a better consistency in its battery retention, hovering above 90 percent capacity until the end of its life some three years later. The only immediate discernible difference between the two is wattage — the elder computer uses 60 watts while the younger has 30 watts — but it could also be how the battery operates within the system as a whole that contributes to the decay. But frankly, if the new Macbook Air follows the same trend as Davenport’s, that glorious “all-day” battery may begin to show some big wear in a short time. It seems, though, that Davenport’s efficient MacBook Pro is the outlier — not necessarily the dwindling Air. The average life expectancy of a lithium-ion battery is roughly two to three years, even with regular battery cycle maintenance. Apple doesn’t prefer to measure battery life in years — rather, it prefers cycles. All Apple laptops built after 2010 have an estimated life of 1000 charge cycles, and the company has an extensive page that stresses routine care and maintenance. In my personal experience, my farm pony still does really great out of the barn. After 1098 charge cycles, I still get between three and a half and four hours of unconnected time and I’m running it nearly all day. But Davenport’s research into his own battery behaviors makes me wonder whether there was more that I could do to extend the battery of my laptop, or if it’s all the product of age. Still, it wouldn’t hurt to try to extend my battery life, so maybe I’ll be able to spend more time away from the nearest outlet. And if you can find me a laptop battery that stands the test of time, then sign me up! What’s the problem? My new Windows 8 Laptop has a battery which lasts for just over 3 hours which is about the same as the macbook pro after 3 years and for a laptop to have that sort of battery life after 3 years is an absolute dream. My old windows vista laptop barely lasted half an hour after 3 years of use which also was purchased in 2009 and it was barely usable. You’re wanting something to be fixed which isn’t broken, your macbook battery life is more than good. My MBA battery healthy decrease from 92% to 83% just for the last month. It’s not normal at all. There is another factor to consider. Over time, we tend to use applications, view more video, while applications consume more resources. Now: Does apple have a guarantee? Is the ‘mileage may vary” disclaimer? How does this compare to other notebooks? I’ve had a very similar experience with my own 2012 Macbook Air. Though I can still go plenty of hours without recharging, I haven’t actually measured how long I can get out of my own normal usage. I notice a large difference from when I first purchased it and Battery Health has it at 88% after 142 cycles and *almost* twelve months old. It does seems rather early to me. I’m interested to see if Mavericks will help or hurt the battery. No mention of typical daily use. Meaningless percentages. 1) What is the statistical validity of a sample size of one (for each model)? 2) Aren’t both charts well within the norm for these battery types? Especially given that we don’t know the use-case details. 3) Do we know about temperature? High temperatures accelerate the decay in battery life. 4) So what? .. does this mean? Does it apply to the new MBA? No data on that. Hopefully our PhD candidate can handle such questions in his oral exam. He never claimed it was a definitive scientific study. But he DOES say that his usage for both computers was about the same. And no…having your battery degrade to 85% capacity in just one year is not normal. that is why Apple says it would be 80% after THREE years. It looks like Apple will owe him a replacement battery in a few months. It looks like he performed several hundred full power cycles in the first year in order to get all the data points. Is that normal? It looks like something happened about 40 days into the test it dropped. 2% in just few days: Anomaly? Product defect? Just one bad battery? MBA got too hot? Change in test methods? There’s nothing stark about this: the observed difference is amplified in the graph by use of a non-zero baseline on the vertical axis and the choice of compressed time scale on the horizontal axis. Given that we have a sample of one each and no controlled usage-recharge cycles, this observation really requires qualification to be of any use and Mr. Davenport should go read his Tufte. Anecdotally speaking, my 2010 MBA 11″ is fine, battery wise. I’ve been concerned that my Macbook Air’s battery might be dying quickly because the laptop gets really hot at times (when I’m watching Netflix on my bed). Mine is the 2011 model and I get about 3 hours of battery while developing applications. I think that overheating may not be something that the Macbook Pro experiences to the same degree, due to its mass and differences in ventilation, etc. What is missing from this article is any information about the use of the Air vs the Pro. Did he use it for the same types of services – doubtful given the trend to heavier video and larger downloads etc vs time? Was he using under battery power more often, draining the battery daily? More charge cycles – probably. No comparison with other brands under identical usage and recharge cycle conditions. Too many factors to make this incredibly enlightening. Of course it does provide for those who love to cheery pick an article for Apple-bashing opportunities to make unfounded claims about the motivations of the company. Bottom line – this is not a scientific report of any kind of experiment with merit given he does not report on the precise conditions that lead to the chart he shows. Most of us Apple afficiondos could care less about the performance of other brands. While it may be valuable for perspective, such comparisons are meaningless when those other products will never be considered because they run on the second-rate Windows platform. AS long as your realize how ignorant you sound with your comment HDboy, then all is not lost. As long as you realize how sad and ignorant you sound from your comment, HDBoy, then al is not lost. As long as you realize how sad and ignorant you sound with your comment, HDBoy, then all hope for you is not lost. Difficult analysis. I find I use my MBA so much more, since it is so portable, than my previous MBP. I also use it much more “off outlet”. That translates to more cycles and faster wear. Would be nice to see the graph plotted as a function of cycles, not just time. Also I hate it when people choose an arbitrary y axis instead of starting at 0 and going to 100%. Why are there only nine data points after 500 days for the MBP? Actually the iphone batteries are replaceable, if you look at the bottom of your phone there are two small screws. Unscrew those two screws slide the back up and you have access to the battery which is not integrated. I guess if you want people always buy new hardware every year or two Apple has a great business model. Me I can’t even fathom buying or recommending laptops that don’t have user replaceable batteries or hard drives that removable for cloning or upgrading the ram. it’s replaceable, just apple does it for you. annoying? yes. have to buy new machine? hardly. Time Machine takes care of the cloning, no need to swap the drives. And if you don’t have an Apple Store near you (which many people don’t) and don’t want to be without your computer for weeks, you are screwed. Software can play a role in this too. Features like Power Nap in Mountain Lion actually silently wake the computer up, even if it’s not plugged in.